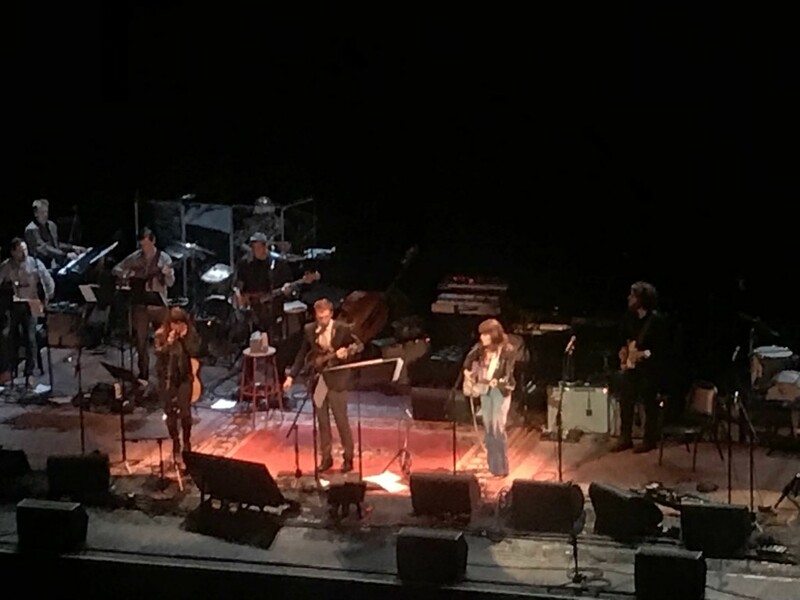 After having soured over the years on “Prairie Home Companion” and its tropes, I was still only mildly interested in its renamed replacement “Live from Here” when it emerged on Saturday afternoon public radio. But having had a chance to attend a performance Friday I’ve changed my mind about the whole thing. First of all, yes it was Friday and hence, not live at all, for whatever reason. Usually these shows are broadcast live and may retain a kind of tension that the more freewheeling performance at the Wiltern Theatre in Los Angeles that plays tonight did not. But mandolin playing host Chris Thile generally kept things rolling from beginning to end as if it were on the radio, taking advantage of taping at one point to stop and tune (and cuss) where usually he could not. Music plays a bigger role on “Live from Here” than it did on “Prairie Home Companion,” though that was a pretty musical show too. But Thile thrives on collaboration and unexpected turns even more so than the old show (and he, unlike Keillor, is a musician first always). This show’s guests included Jenny Lewis, who sang a few songs from her forthcoming album “On the Line” that compared well with a couple from the past, including the Rilo Kiley tune with which she began, “Silver Lining.” Though she was strong with her small ensemble, just about everything she performed she performed with Sara Watkins, the Nickel Creek fiddler who is now in the trio I’m With Her. Watkins seemed to accompany everyone (as Thile often did), from Lewis to the whistling other guest Andrew Bird. Mostly, she was the crucial third to a Nickel Creek reunion with Thile and her brother Sean Watkins. The new bluegrass trio played quite a lot of tunes through the night, both in the recording of the show and in the coda for the audience that followed. As supportive as she is vocally, Sara Watkins was a standout taking the solo vocal slot in honoring both Melanie (the difficult “Brand New Key”) and Sam Phillips in the birthdays section — that eclectic segment whose crazy transition from rocking Kinks to early Mendelssohn to a Langford Wilson poem (performed to Duke Ellington) showed the wide range of the musicians’ taste and prowess. They also noted the 60th anniversary of the Day the Music Died this weekend with a blazing salute to Los Angeles’ own Richie Valens. The theme was California, maybe the only warm corner in a country locked in a deep freeze, so it began with the remarkable group choral of the Beach Boys’ “My Prayer” at the beginning of the recorded show (and also later, after the recording was over, because Thile had so much fun doing it again). In addition to that celestial opening to “Smile” came a dreamy version of “Don’t Talk (Put Your Head on My Shoulder)” led by Madison Cunningham (a “Prairie” holdover who is now part of Bird’s band) that ought to make it to air some day because it was so good. On the other hand, a reading of a Charles Bukowski poem after the recording may find its way into tonight’s show because it worked out so well, Thile said backstage after. The comedy portion of the show has been completely changed from what was once the basis of “Prairie Home Companion”; Lake Woebegon is gone, gone, gone. In their place are some smart little skits from some Upright Citizens Brigade veterans that are also a little more sly and modern sounding than past bits. Tom Papa’s weekly monologue is both folksy and disarming in a way that fits well the original tone of the show. Adding New Yorker humorists like Cirocco Dunlap addressing New York / L.A. differences in extreme terms makes it a smarter broadcast as well. Sarah Silverman’s guest turn was unusual; less raunchy than usual but still trying to push the radio envelope. Also because of the radio, she was more casually dressed than usual, in T shirt and stocking cap. Had she been a little more uninhibited by the broadcast, it would have been more like her gigs at Largo, the L.A. nightclub where music and comedy similarly mix easily. And what about the visual aspect of “Live from Here”? Thile mentioned more than once the colorful aspects that didn’t translate to radio, from Andrew Bird’s one red sock to Lewis’ rainbow painted acoustic guitar. But nobody mentioned the array of Persian rugs on which they all stood. Live or not, “Live from Here” succeeds as a kind of standout in radio that has wholly differentiated itself from its original footing while being a vibrant showcase for largely acoustic contemporary musicians.